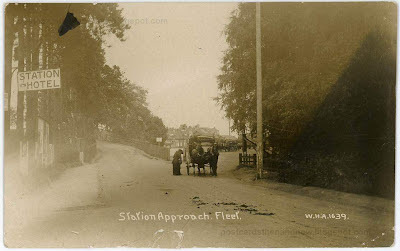 Fleet, Hampshire, Station Approach circa 1913. The scene looks quite different now, though the layout is essentially the same. The Station Hotel referred to on the left is now called 'The Links Hotel'. It looks like the woman is about to pay the cab driver. Postcard by W. H. Applebee of Ashford. Click the postcard to enlarge. Another photo that makes me wonder why the photographer produced it. Was Aunt Mary to buy one at the station so to send home - "arrived safely"? The Google view was funny with the unexpected roundabout with two women trying to cross. British roundabouts seem mostly a modern invention, have you found a vintage card of one? Ooh, good point Mike, I don't know when they were introduced. I'll have to see if I can find one on an old postcard.